Visitors pose behind an orchid arrangement at International Orchid Show. Orchids are one of the largest families of flowering plants with some 28,000 different species. They are also widely admired for their beauty and pleasant fragrance, and an object of enthusiastic crowd of growers who compete in various orchid shows on who is able to cultivate the most beautiful and original set of the flowers. Okinawa International Orchid Show is the oldest of the international orchid shows in Japan and the only one in the nation that gives out the Prime Minister’s Award. 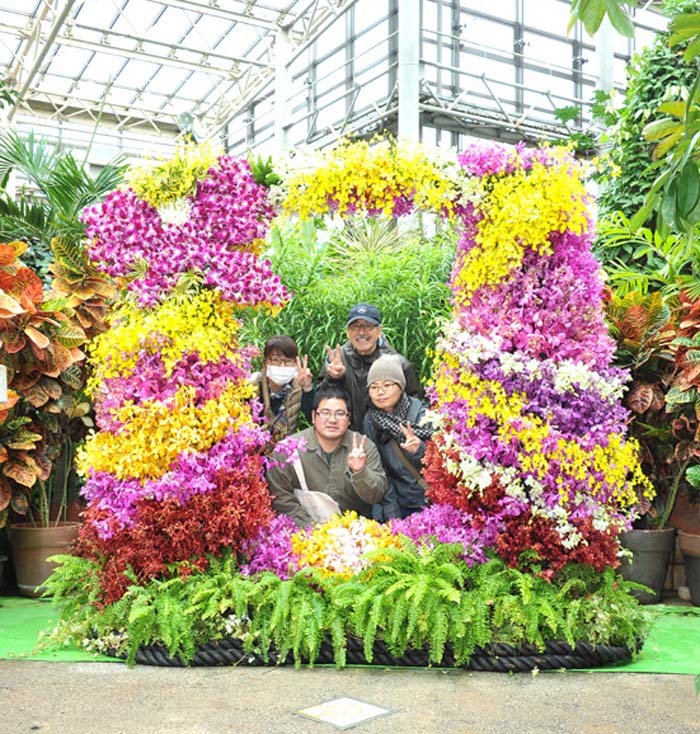 It’s also the largest orchid show in the Okinawa Prefecture. The show features more than 20,000 orchids on its exhibits including potted plants and cut flower arrangements, and needless to say, it offers countless fantastic photo opportunities to visitors. There will also be fun activities to participate throughout the show for children and adults alike. The show, organized for the 31st time this year, runs from Saturday, Feb. 4 through Sunday, Feb. 12, at the Tropical Dream Center in the Ocean Expo Park in Motobu. The show is open from 8:00 to 17:30, and the admission is ¥690 for adults, ¥350 for junior high and elementary school age children. Children under 6 years of age are free. Those who visit the Churaumi Aquarium before visiting the Orchid Show can enter at half price by showing their Churaumi ticket.